Following the recent announcement that adidas will once again partner up with Brazilian club Flamengo, the two parties are proud to reveal the much-anticipated kit to be worn on field next season. After the announcement of the new contract with adidas, the new jerseys sold out in less than 10 days of advance sales. "We made every effort to ensure that the jersey that marks our return would truly be worthy of the giant team that is Flamengo. 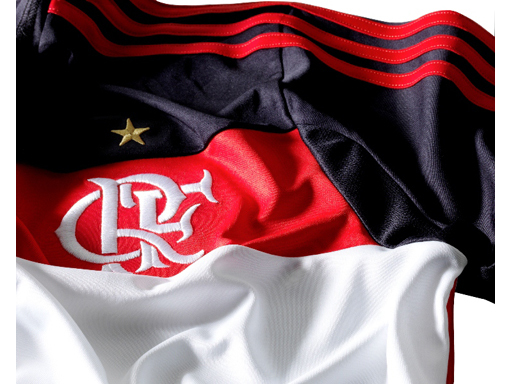 We believe that the Red and Black Nation will be proud," stated Fernando Basualdo, president of adidas Brazil. The new adidas Flamengo home shirt has thick black and red stripes, as well as the team's crest embroidered on one of the black stripes. The away jersey is reminiscent of the one worn when Flamengo won the world title against Liverpool. The design is predominantly white, with details in black and red on the shoulders. Both uniforms sport a detail on the back of the jersey that pays homage to the chorus of the club's anthem: "once Flamengo, always Flamengo." Eduardo Bandeira de Mello, Flamengo's president, said: "At the beginning of the month, we celebrated the return of this partnership that left its mark in the history of Clube de Regatas do Flamengo. Today, we give the fans what they have long been waiting for: the new Red and Black jersey, made by adidas. I have no doubt that this jersey will bring new glory to Flamengo." Both the home and away uniforms employ adidas´ ClimaCool® technology, which takes into account where and how the body produces the most heat and sweat, using specific fabrics in these regions to improve breathability and allow the athlete to maintain his ideal body temperature. Flamengo will debut the new uniforms this coming Sunday, May 26th, when they play Santos in the new Mané Garrincha stadium. From today (May 24th), the new kit will be available at adidas stores, on the brand's website (www.adidas.com.br) and at the team's official stores. For more information please see: www.facebook.com/adidasfootball or join the conversation @adidasfootball.